Uranus, the third largest planet in the Solar System, is named after the ancient Greek god of the heavens. With its uniform bluish-green appearance, the planet looks quite boring at first glance; however, it is probably the most unusual planet traveling around the Sun. Although it belongs to the family of giant planets, it is only four times larger than Earth. Yet, since it is 19 times farther from the Sun than the Earth, it takes almost 84 years for Uranus to orbit around it. Like the rest of the gaseous planets, Uranus turns around its axis fairly quickly. The day is only 17 hours long. Although Uranus belongs to the family of gaseous planets, it contains less hydrogen than other gaseous planets and a much higher percentage of rocks and ice. Hydrogen constitutes 83% of the atmosphere. There also about 15% helium and 2% methane. Methane has the ability to absorb red light from the Sun, making the planet appear blue. Even though Voyager 2 spacecraft did not see any bright features in the atmosphere, this does not mean that they do not exist. They might appear for a limited time when the seasons change, which would be a challenge as the seasons seldom change with such a long year on Uranus totaling 84 Earth years. 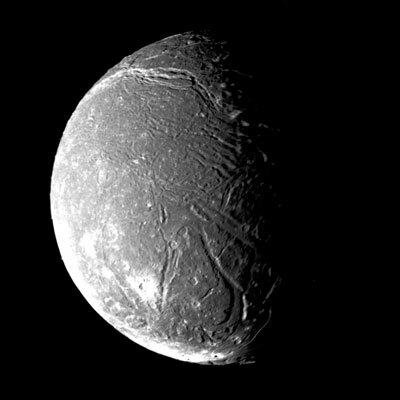 Under the thick layer of clouds, Uranus has a surface of ice and rocks. The planet does not have a layer of liquid hydrogen like Jupiter and Saturn, but it has larger rock core. At such a great distance from the sun, Uranus is a bitterly cold planet. The temperature is about -195°K, which is actually higher than expected. This means that Uranus also has his own internal source of energy due to gravitational contraction. Uranus has an unusual magnetic field which is moved out of center and inclined by 60 degrees off its axis. Because of the great distance it is difficult to study Uranus with a telescope. Even with big telescope it looks like pale bluish-green circle. The only spacecraft that visited the planet was the Voyager 2 in 1986. It main contributions included photographing the planet and discovering five new rings and four moons. Like the other gaseous planets, Uranus has rings and moons. Uranus's rings are dark like Jupiter's. 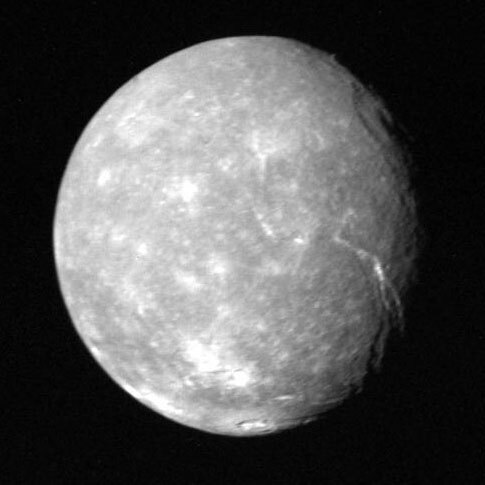 Uranus has 27 moons of which the five largest are: Miranda, Ariel, Umbriel, Titania and Oberon. All of them are named after Shakespearean heroes. While the biggest satellites formed together with the planet, the smallest ones are probably captured objects from Kuiper belt. The orientation of Uranus on its axis is quite unusual. 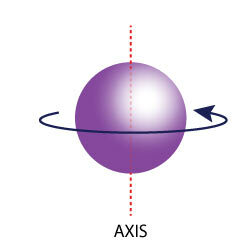 While the other planets have axises almost perpendicular or slightly tilted to their orbital plane, Uranus's axis almost lies directly in this plane. It looks like something "kicked" the planet aside. As a result the seasons are quite strange. During the summer in the south hemisphere the south pole looks towards the sun and is the "hottest" place in the planet. The summer lasts about 42 years and the sun never sets on the pole (similar to "white nights" around the Earth's poles). When the seasons change the equator is the hottest place. The cloud activity seems to increase during this time. Thereafter the summer for the north hemisphere begins another 42 year cycle. Fast winds blow on Uranus. With average speeds of 360 mph, these winds are two and a half times faster then the most powerful winds on Earth. 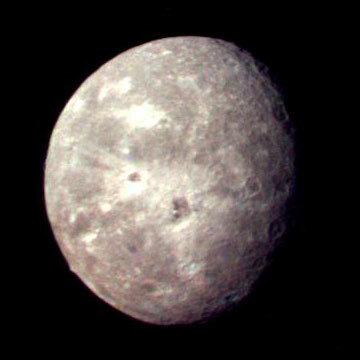 Even though Uranus is visible with the naked eye, it wasn't discovered until 1781, when British astronomer William Herschel first saw it through his 150 mm telescope. 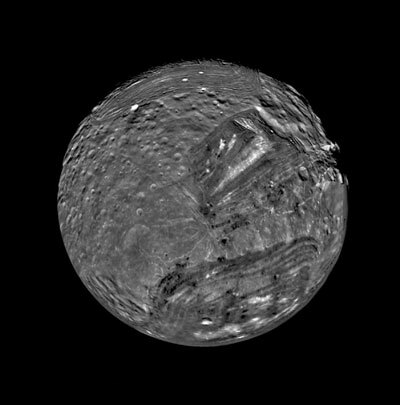 Miranda, the innermost of the large moons, is particularly interesting. Its surface looks like jumbled mess: huge cliffs, grooves and valleys. This unusual appearance could be result either of tectonic activity or large impacts from meteorites. A straight line around which an object rotates. Planets that are composed mostly of gaseous material, rather than rocky or solid material. The four planets in the outer Solar System are all gas planets. The gaseous material surrounding planets; the air surrounding Earth. A colorless and oderless single-atom gas, it is the second most abundant element in the universe. A colorless, odorless gas and the main component of natural gas. The second half of the Voyager mission and launched by NASA on August 1977, Voyager 2 sent back data on previously unknown rings of Jupiter, detailed photographs of the Great Red Spot, close-up pictures of the moon Europa, and additional detailed photographs of the surface of Saturn. Voyager 2 also managed to continue on to the planet Uranus and gather more valuable information. 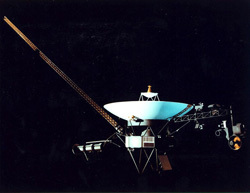 Like its sibling, Voyager 1, Voyager 2 also carries a copy of the Golden Record. One of the fundamental forces of physics; gravity is responsible for the attraction of bodies on the surface of a planet to the mass of the planet. A condition generated by electrons moving through space. 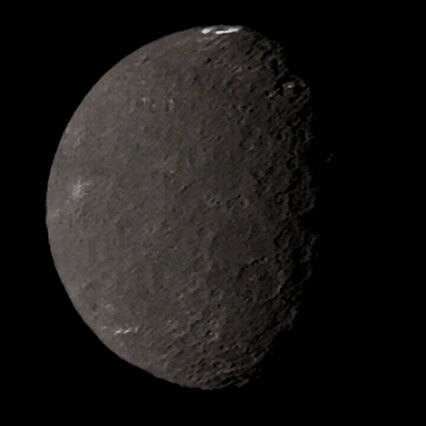 A region in the Solar System that extends beyond the orbit of Neptune and is the home of remnants from the formation of the Solar System, as well as the dwarf planet Pluto.